We hope your year is off to a wonderful start! St. Louis finally received its first snowfall, and everything looks beautiful outside. 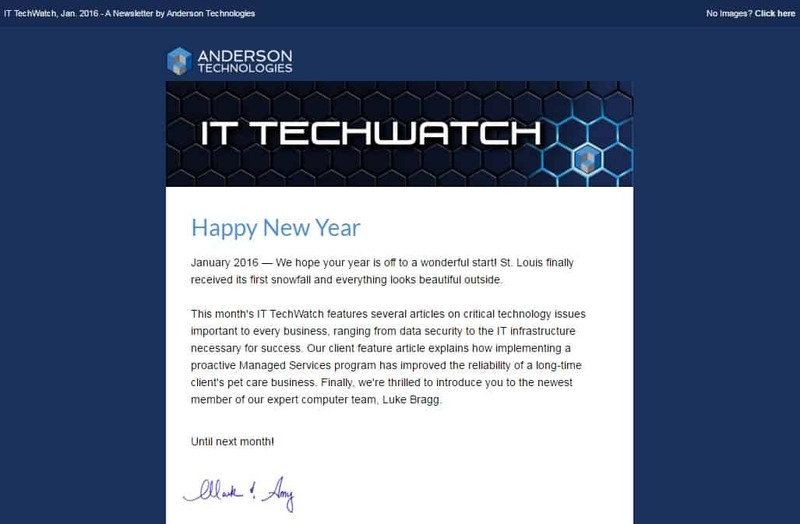 On January 21st, we sent out this month’s IT TechWatch, which featured several articles on critical technology issues important to every business ranging from data security to the IT infrastructure necessary for success. Our client feature article explains how implementing a proactive Managed Services program improved the reliability of a long-time client’s pet care business. Finally, we’re thrilled to introduce you to the newest member of our expert computer team, Luke Bragg. If you’d like to receive our newsletter on an ongoing basis, there’s a sign-up section on our home page. Two primary categories must be addressed: internal and external systems and efforts. Throughout the coming year, our St. Louis computer experts will share more detailed information on many of these areas to give you technological peace of mind. For now, let’s take a quick look at infrastructure issues you need to be thinking about. Do clients or employees bring their laptops to meetings in conference rooms? Do you allow open access to your Wi-Fi network, or are those networks password-protected? Do you have both PCs and Macs and, if so, can they talk to each other? Can they both save documents to any shared drives you may have? When you send something to the printer does it actually print, or does it go into a “black hole” of unprinted documents? Your networks should be secure and accessible only by those with approved access. Are there any vulnerabilities in your systems that need to be remedied? Losing a file erases your time, data, and effort. Make sure you have backups that actually work. Have you tested your backup systems recently to see if you can actually retrieve a document from your backup system? Just because it’s sitting somewhere “in the cloud” doesn’t necessarily mean that it’s properly backed up. It only takes one corrupted file to wreak havoc with your whole data infrastructure. If you are in a non-critical industry, it might not seem worth the extra effort to properly protect yourself. But if data reliability and systems functionality are important to your business, you’ll want your systems locked down like Fort Knox. Whether the law requires you (for firms entrusted with sensitive client information) or whether it’s more of an expectation in your industry, you need to have the proper systems in place to protect customer records and personal data. Cyber crime happens at the speed of data. Hackers know that a brilliant piece of malicious code today will be worth very little six months from now. They won’t wait, neither should you. For some industries, there are very specific, very strict rules that need to be followed; for others, there are merely “guidelines” that act as the hallmark of a company following “best practices.” Do you know the rules for your industry, and do you have a plan to keep abreast of changing regulations? Externally: What Do You Need? Of the hundreds of e-mails you get a day, how many of them could be classified as digital junk mail? Can you access your e-mails from anywhere, and does your e-mail automatically update in a timely manner? While it might seem like a hassle to switch e-mail platform providers, the benefits might be worth it! Websites, social media platforms, SEO efforts, Google AdWords campaigns and a whole host of other digital outlets should put you in the spotlight in the most strategically-grounded way. How many problems do you experience with your VoIP phone system in a day?Lost calls equate to frustrated customers and potentially lost sales. Don’t let an outdated telephone system weaken your growth efforts. Let’s face it; we live in a shared, digital world where sending files via FTP and e-mail is considered too slow. People don’t want to wait for files to be delivered via e-mail; they want them immediately! And they want to be able to make changes and share those changes with colleagues or clients right now. Set yourself up with fastest methods of data transfer and enhance your collaboration efforts. There are a many components to keep track of and successfully put in place in order to fully realize a reliable IT infrastructure. Master them and your business will experience less hassles, less downtime, and less computer angst. Keep a firm grasp on these core concepts and you’ll experience more—more productivity, more confidence, and more success. And as always, if you have a pressing need we’d be happy to help! Luke has worked for a wide variety of companies like Empire District Electric Company, Baptist Hospitals of Southeast Texas, and most recently Tapestry Solutions (a subsidiary of Boeing) in areas that required a focus on computer system architecture as well as very high-level technological expertise. Luke also understands the intricacies of system-wide solutions to protect against a host of security threats, including viruses, malware, spyware, and ransomware. He’s right at home managing large computer networks, installing and administering over 100 servers and deploying over 1,000 virtual desktops in one environment. Luke is enthusiastic about working with clients one-on-one and values that interaction. He explains, “I love the vision of Anderson Technologies’ personalized service and ‘take-the-time-to-do-it-right’ mentality. As a systems administrator, you wear many hats, and I’m excited to know I will be making a real difference in the lives and businesses of our clients.” Luke is immediately available to work with all clients, getting them properly set up with our proprietary Managed Tech Services, installing system upgrades, and increasing security protection to keep client data from being compromised. Luke lives in Swansea, Illinois with his children and wife, Amy, who teaches first and second grade. They have three children, James (11), Lucas and Logan (7 year old twins!) who keep them very active. Luke also enjoys singing in his church. Congratulations Luke, and welcome to the team!